If you are someone who can't stop singing praises of Hyderabadi Biryani then this photo proves your claim. 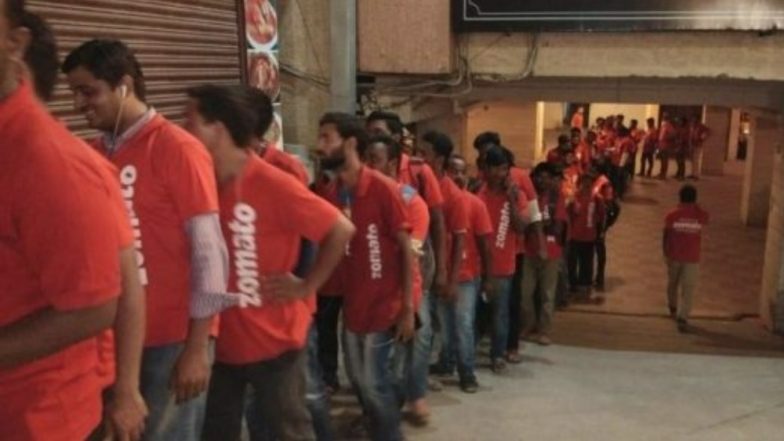 Zomato on Wednesday took to Twitter sharing photo of a long queue of Zomato executives waiting for their order in front of a restaurant in Hyderabad known for its biryani. The tweet was quick to go viral on social media with people talking about Indians love for biryani. The photo was captured from in front of Hyderabad's Bawarchi Restaurant which is quite popular for their chicken biryani. Zomato India shared the photo saying, "Which restaurant from your city deserves this kind of a queue?" As photo began to go viral, Zomato tweeted saying, "Oh BTW, this picture was taken outside Bawarchi restaurant in Hyderabad. The total number of orders they receive in a day will blow your mind." According to the food delivery app's annual report, Bawarchi receives orders for around 2,000 biryanis every single day from Zomato. And the photo was captured during one of their regular days when Zomato delivery boys lined up waiting for their orders. Zomato Customer Refund Query Gets 'Maa Kasam, Milega Refund' Response, Reddit Goes Crazy. The photo went viral on Reddit with people coming up with memes and jokes on the photo. Sharing the picture, a social media user wrote, "When a restaurant provides a free taste for all Zomato delivery guys." Meanwhile, tweeple wrote, "Some last date for getting Aadhar done?" as other one said, "Liquor Shop, after 10 pm."